This is a very interesting salad dish of cooked unripe jackfruit. Usually unripe jackfruit is used in most Filipino cooking and not as salad. If you have seen or tasted a dish called ginataang langka, I think you will say that this recipe I have here is a salad version. Maybe you can also use a relative fruit called camansi or breadnut that are also cooked in a similar kind of dishes using unripe jackfruit. This salad dish uses coconut milk mixture, consisting of coconut milk, vinegar, garlic, onion, pepper, sugar and salt as dressing. And to garnish your salad, you can use any kind of flaked smoked fish. 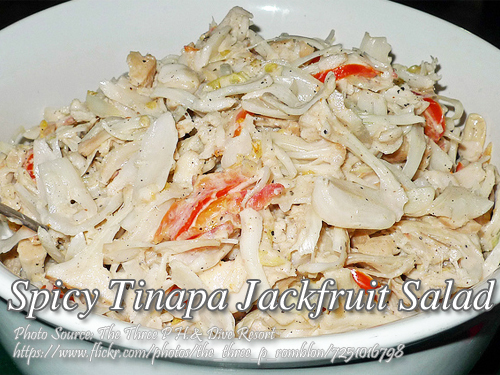 To make spicy tinapa jackfruit salad; Cook jackfruit in boiling water until tender. Remove from heat and squeeze out as much liquid as possible. Remove seeds and separate strands. Set aside. Strain coconut milk and pour into a bowl. Add all other ingredients except tinapa and mix well. Add the cooked langka. Season to taste. Garnish with flaked tinapa on top when serving. Cook jackfruit in boiling water until tender. Remove from heat and squeeze out as much liquid as possible. Remove seeds and separate strands. Set aside. Strain coconut milk and pour into a bowl. Add all other ingredients except tinapa and mix well. Add the cooked langka. Season to taste. Garnish with flaked tinapa on top when serving.